This article is also now published in the Globe and Mail – see it here. If you are still talking about the knowledge economy, you might want to upgrade your narrative. It’s now all about the innovation economy. And the question is — are you ready for it? See Quiz. For quite some time now, careerists have prepared themselves for knowledge-based careers. They learned skills, acquired credentials, and entered professions that had some sort of predictable roadmap to career success in the so-called knowledge economy. This worked well — and for many it still does. But disruptive technologies, new business models and an accelerating pace of change are shifting the landscape faster than we could whistle for a taxi. Or shall I say “text Uber”. Despite doing all the ‘right’ things – many (people, businesses, industries) will find themselves sidelined if unprepared. (Ask any marketer or business leader who hasn’t kept up with the ‘digital economy’…. the old ways just don’t seem to cut it these days.). While knowledge and related professional skills will still be critically important the market will increasingly call for people with additional skills, mindsets and abilities to drive innovation or at least keep up! And these skills won’t all be technical in nature (i.e. skills of your ‘trade’) – you will also need ample strengths from the emotional intelligence spectrum – resilience, adaptability, self awareness – and more. Change and innovation will be the new normal — and a constant (how’s that for a paradox?). Whether you are a careerist (i.e. with a ‘job’), a freelance/solopreneur or head of a business — it’s all up for grabs in the innovation economy. If you’re in the paradigm of finding (or believe that you are in) the perfect job to last for your career, or that you’ve finally acquired all the right skills, credentials and abilities to protect your employability for the long haul – think again. Jobs, skills, professions will be in continual evolution and change. What you need to know and be able to do will be a moving target. And while change isn’t new – the pace of change is accelerating faster than at any time before. By all means find the work you love and train for that – but stay on your toes, be curious, and active in your learning and development throughout your career. Watch not where the puck has landed but where it might be heading. And even then – be prepared for surprises. If you are a creature of habit or find it hard to shift gears you risk being left behind. Those who have the ability to adapt (‘adapt-ability’) will have a better chance of surviving and thriving in their careers. If adapting to or creating change doesn’t yet come naturally for you there’s good news. 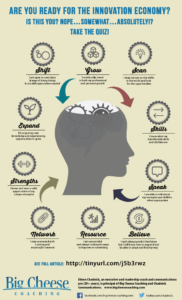 Agility – in mindset, thinking, and habits – can be developed. These competencies fall within the emotional intelligence spectrum and are not fixed personality traits. You can learn to do better and experience change with more ease. You might not be the change-leader but if you can get on the train quicker and without resistance, well, that will serve you better. Bottom line: add ‘agility and flexibility’ to your personal development plan. Crossroads used to happen only occasionally and only to some people or at certain points in their lives and careers. They are increasingly more common and more frequent. Sometimes crossroads bring feelings of uncertainty and confusion (what to do; which way to go). Try not to sweat these times. Resistance and judging will only make it harder. Embrace these times as part of your evolution. Keep an open mind and get the support you need to navigate them with more confidence. If only we can predict the change then we can get ready and be prepared. Being prepared at all times is a great strategy but in the innovation economy chances are that some of the shifts will come almost unannounced or be invisible to you until they arrive. Best way to prepare is to stay nimble; keep a good network; know and build on your strengths, skills and abilities. And be savvy and know how to use your transferable skills (do you know what yours are?). I get calls from well-meaning parents wanting me to “coach” (aka in their translation: convince) their kids to follow more ‘secure’ paths and ‘settle’ into one career path – i.e. just like they did. While parents, teachers, friends may be great sources of wisdom, experience, connections – take heed: what worked for them may no longer be workable in the new paradigm of work. So by all means, listen, learn and get ideas and input from many people but question any advice you receive with healthy skepticism when warranted. Shout out to Parents – by all means be there for your kids and talk to them about careers; but instead of prescribing what worked for you recognize these are different times. Focus on teaching them to be resourceful, agile, innovative and self-aware. If you are reading this and thinking that this kind of thing is only relevant to the start-ups and perhaps, newer and “edgier” sectors and companies, then think again. There is no sector or industry that will not be transformed in some way by the innovation economy. Consider banking for example — one of the oldest, most traditional and stable sectors in our economy. The banking of today is no longer the banking of yesterday and it will likely look quite different tomorrow too. Banks are driving or at least partaking in much of the innovation effort today. They are partnering with Fintechs, trying on new technology, and changing how we bank, work, and much more. Quite frankly, if you ask me, I think the banks are starting to look sexier and more interesting these days – but that may just be me. Ditto for most all sectors. ….and so it goes. Will you be part of the change-makers? 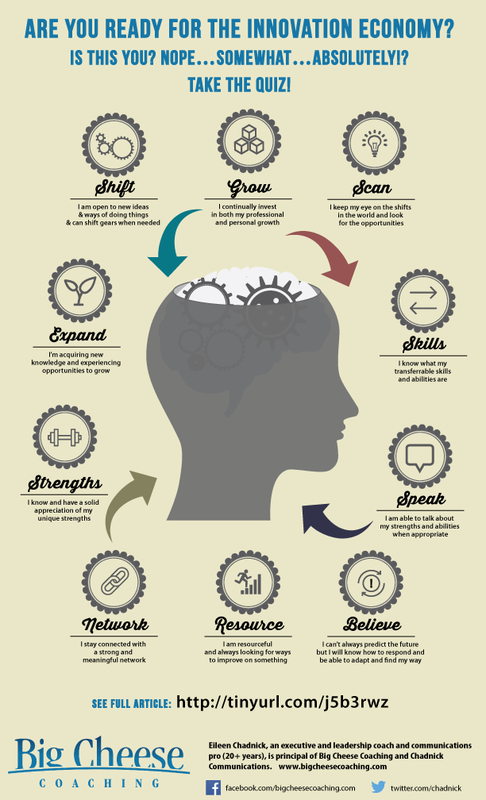 Will you have the skills, mindset to lead innovation? At minimum, can you keep up and be employable knowing you can’t yet see all that is coming? Eileen Chadnick, PCC, ACPC, ABC, is an executive and leadership coach and communications pro (20+ years). She is principal of Big Cheese Coaching and Chadnick Communications in Toronto. She is author of Ease: Manage overwhelm in Times of Crazy Busy. Follow her on Facebook at: facebook/bigcheesecoaching.com and Twitter@Chadnick.